"The Devil You Know" is scheduled for release on April 28 via Rhino. The LP was recorded at Rockfield Studios in Wales, U.K. where the 1992 SABBATH album "Dehumanizer" was also tracked. "Everyone had so much fun playing together that we didn't want it to end," says the group. "We started writing together and the songs started flowing like we never stopped. We wound up writing and recording an album that stands up to anything we've ever done. We're really proud of the music and excited for people to hear it." "Each of us submitted a CD of our ideas, and we narrowed it down from there," Iommi told Classic Rock. "In some ways it was like picking up where we'd left off with 'Dehumanizer'." In a recent interview with Revolver magazine, Ronnie James Dio described the material on the HEAVEN AND HELL album as "a real cross-section of everything we've done, from 'Heaven and Hell' through 'Mob Rules' and 'Dehumanizer'. I think there's a lot of 'Dehumanizer' in it, but a lot of other things, too, a real good blend of what this band has represented." HEAVEN AND HELL will premier "The Devil You Know" on the April 29 edition of the nationally syndicated radio show "Rockline" with host Bob Coburn at 8:30 p.m. PT / 11:30 p.m. ET. An encore presentation of the show will air on May 4. Fans are encouraged to speak with HEAVEN AND HELL by calling 1-800-344-ROCK (7625). 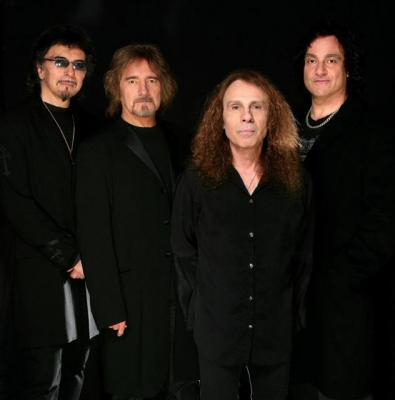 Three years ago, Dio, Iommi, Butler and Appice reunited to record a trio of new songs for Rhino's "Black Sabbath: The Dio Years" before launching a highly anticipated and greatly acclaimed world tour under their new moniker HEAVEN AND HELL. Revitalized by the reunion, the lineup returned to the studio to record the first-ever full-length studio album from HEAVEN AND HELL. To whet the fans' appetites for the new album, HEAVEN AND HELL hit the road last summer for a short stint on the Metal Masters Tour, a month-long North American trek with JUDAS PRIEST, MOTÖRHEAD, and TESTAMENT. Regarding the band's decision to continue to operate as HEAVEN AND HELL rather than BLACK SABBATH, Iommi told Billboard.com last year, "It really is BLACK SABBATH, whatever we do. We just choose to go out as HEAVEN AND HELL so everyone knows what they're getting [and] so people won't expect to hear 'Iron Man' and all those songs. We've done them for so many years, it's nice to do just all the stuff with did with Ronnie again."